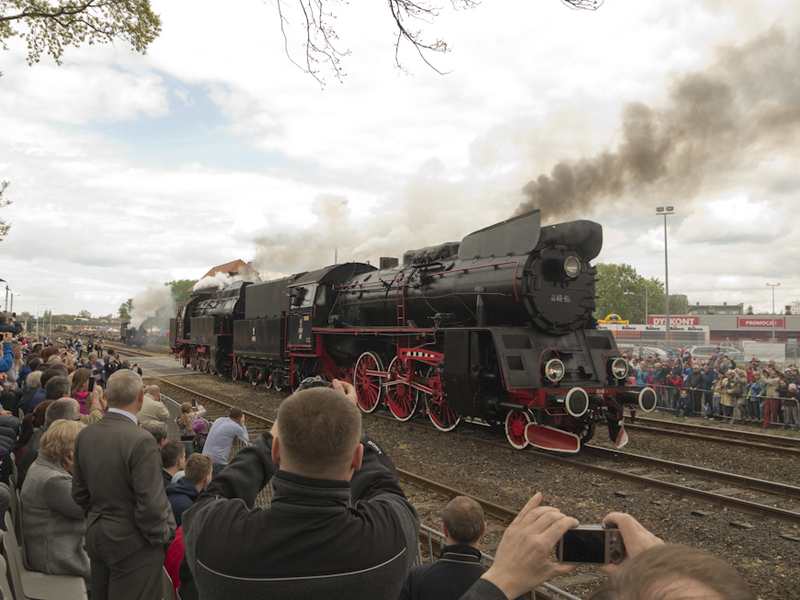 Wolsztyn’s 22nd annual steam locomotive parade had just three working locos! 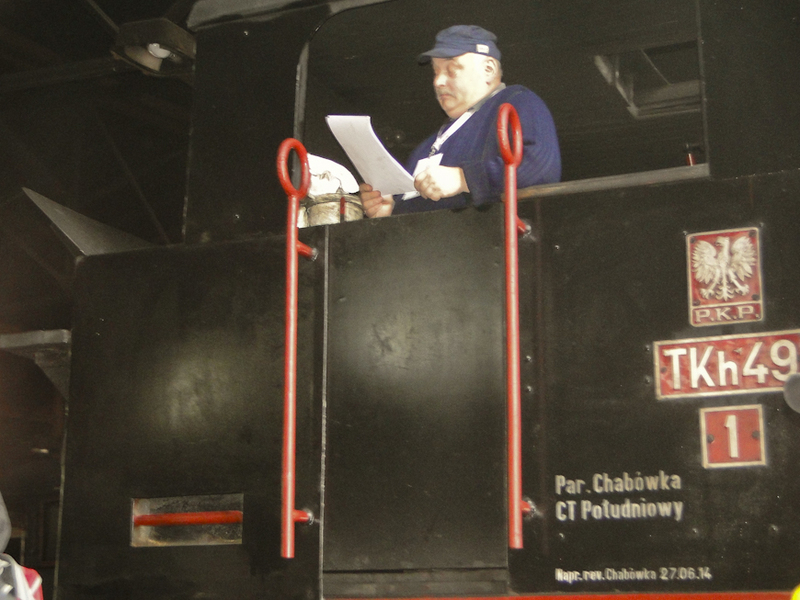 This Chabówka driver in charge of 0-6-0T Tkh49-1 was not the only person trying to figure out what was going on. Photo Marta Goltz. 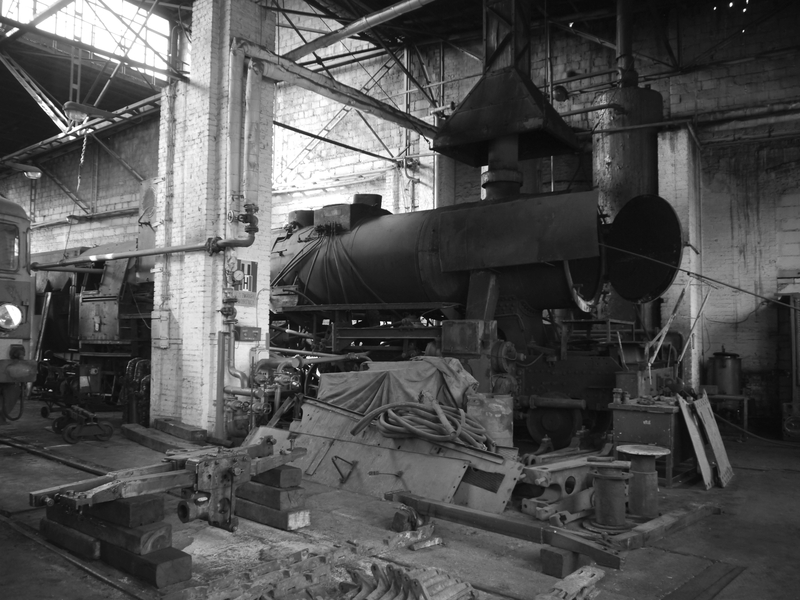 The non-working ‘awaiting overhaul’ engines were left in the shed, making photography difficult. Photo Jan Borzuchowski. The joy of Wolsztyn. Hands up who remembers when UK shed open days were like this? Photo Marta Goltz. Shy film star. Curiously, a tent blocked off the possibility of a proper ‘head-on’ photo of Ok1-359. 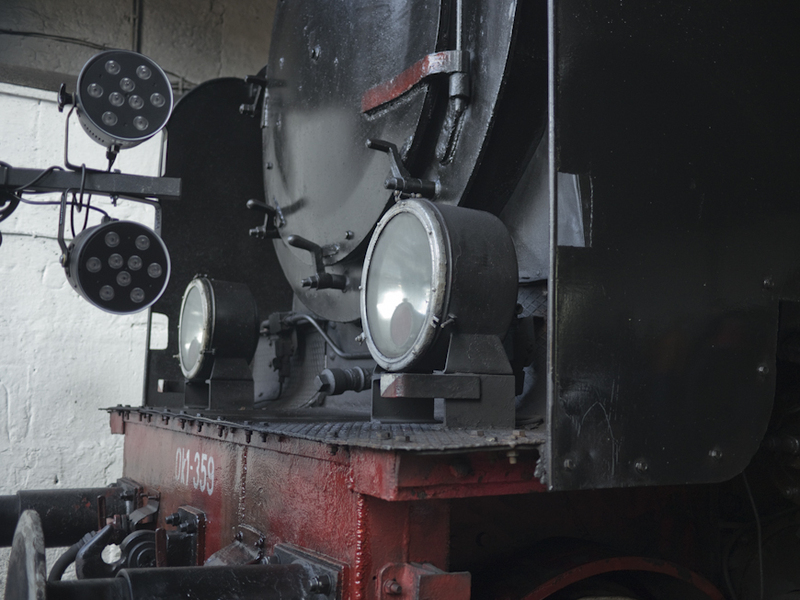 The loco has appeared in many films including Roman Polanski’s Oscar-winning “The Pianist”. Photo Jan Borzuchowski. While members of the public were permitted to explore nearly all the engines, Ok1-359 was awarded star treatment ond its footplate was a strictly ‘no-go’ area. Photo Jan Borzuchowski. 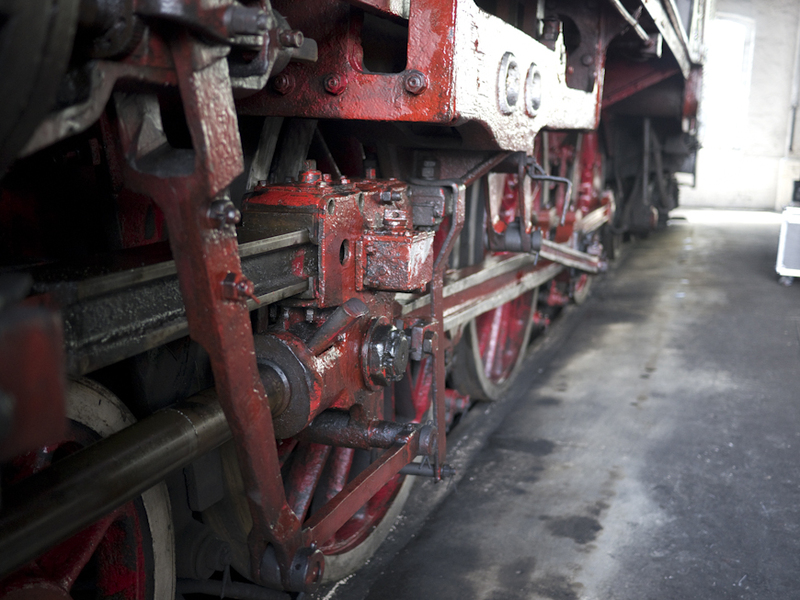 Given a properly dried out boiler and generous doses of oil a steam loco will last forever. Ok1-359 was built by BMAG in 1917, and was last steamed in 2009. Photo Jan Borzuchowski. Good practice – a pragmatic attitude to health and safety, with the running lines securely protected. 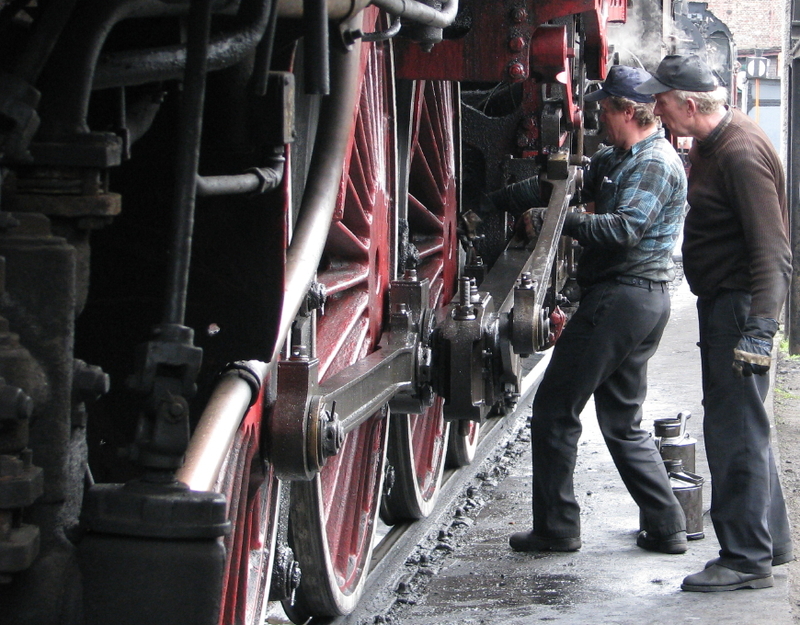 Poor practice – Ty1-76 like many other historic steam locomotives is kept out in the open all the year round. Photo Jan Borzuchowski. 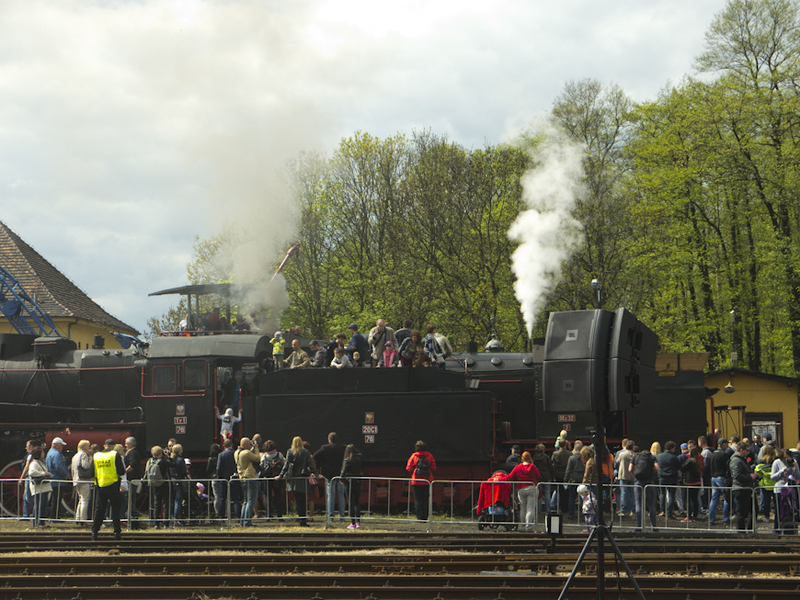 Thousands have come to see the engines, but only three locos appear at the parade: Wolsztyn only ‘in-ticket’ loco Ol49-69, and Chabówka’s 2-10-2T Okz32-2 and 0-6-oT Tkh49-1. What does the future bode for Wolsztyn – a clear road ahead or storm clouds gathering? Photo Jan Borzuchowski. Many thanks to BTWT’s guest photographers. Jan Borzuchowski and Marta Goltz. Also special thanks to all our friends in PKP Cargo without whose assistance this report would have been impossible. With perhaps, the future of the daily ex Wolsztyn steam services being the one exception, no campaign has mobilised BTWT readers as much as the battle to save the Krosniewice Narrow Gauge Railway. Alas it seems that all our attempts – as well as the stalwart efforts of local enthusiasts – have failed to influence the decision makers. 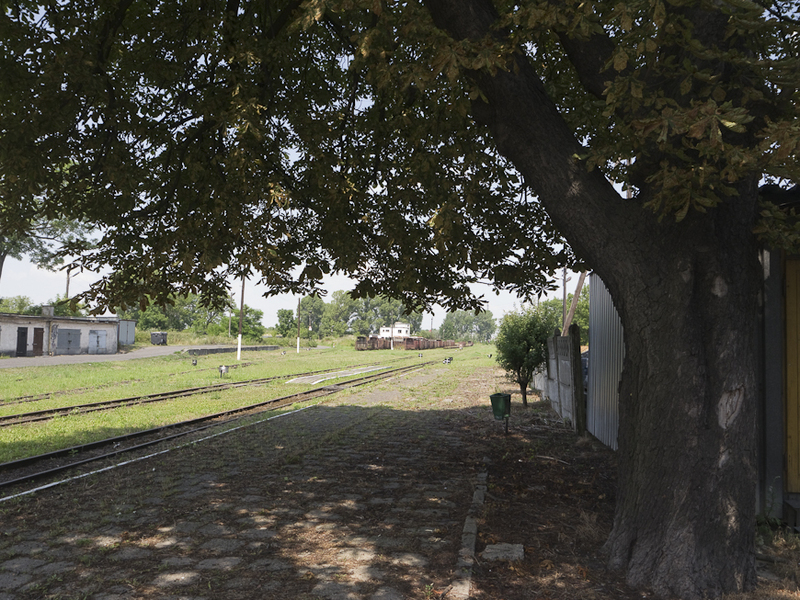 As the various local authorities prepare to take over sections of the line, rip up the track and convert them into cycle paths, on July 6 our reporter paid a last nostalgic visit to photograph the railway’s remains at Ozorkow and Krosniewice. The text and photographs in this article may be republished under the terms of the Creative Commons Attribution-NonCommercial-ShareAlike 4.0 International licence. 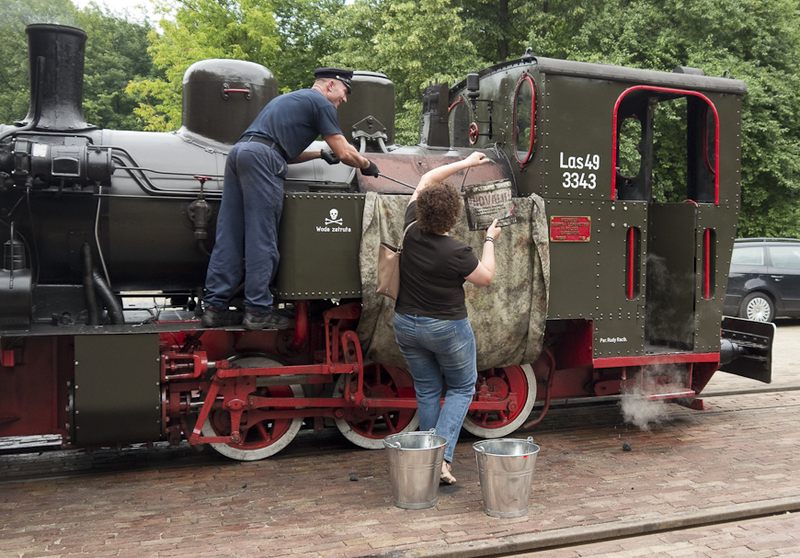 Volunteers tidy the path leading to the narrow gauge platform at Ozorkow. An Open Day is held each Sunday afternoon at the station. Photo (CC BY-NC-SA 4.0) BTWT. In its heyday the Kujawy Narrow Gauge Railways – comprising some 1,000 km of 600mm and 750mm lines – were Poland’s largest narrow gauge network. Starting from various independent agricultural and sugar beet railways the lines were expanded and connected together into a 600mm network for the purposes of supplying the Prussian forces during WW I. When Poland recovered its independence the ‘main line’ was converted to 750mm. PKP constructed two new buildings at Krosniewice in the latest Art Deco style – the station building and the running shed. One of the attractions of the Sunday Open Days is the possibility of a ride on a platelayer’s trolley. Local volunteers pose with an itinerant Englishman. Photo (CC BY-NC-SA 4.0) BTWT. 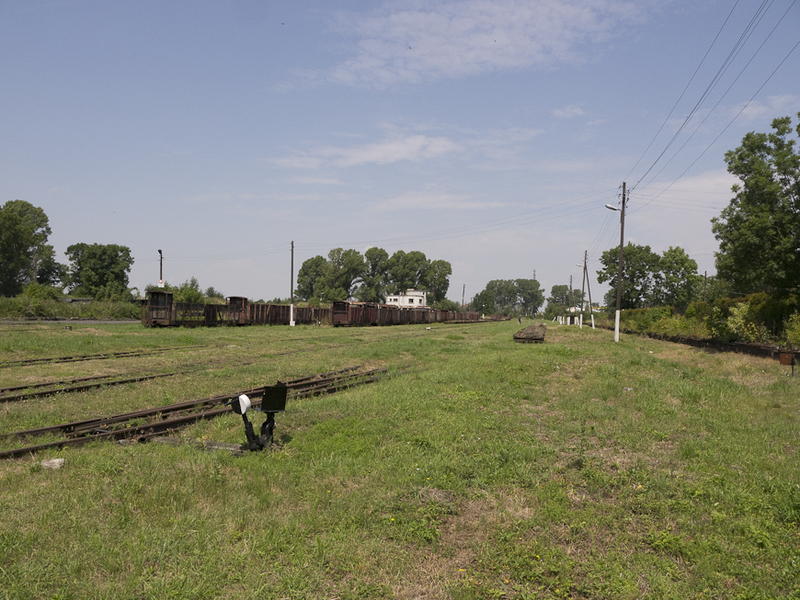 The Kujawy Railways survived WWW II and some of the remaining 600mm feeder lines were converted to 750mm gauge. 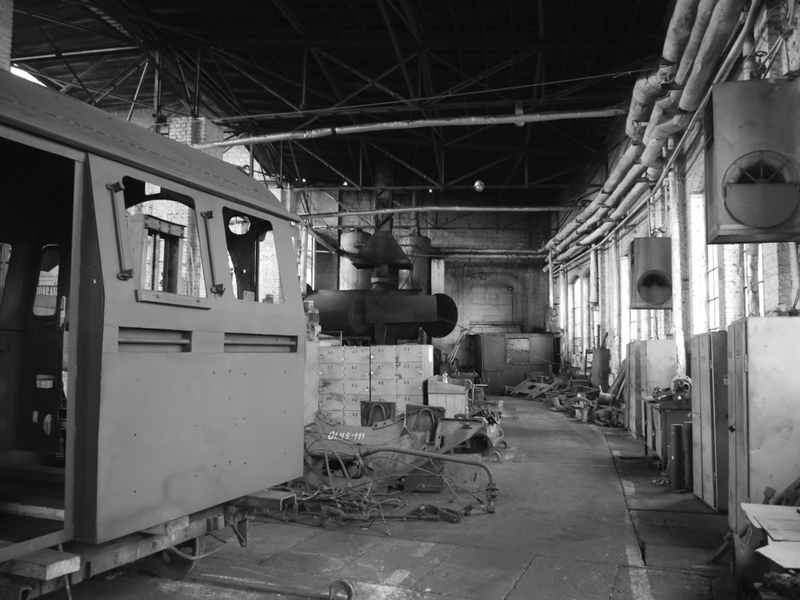 At the start of 1991, PKP reorganised the Kujawy Narrow Gauge Railways into three independent railways the Gniezno Narrow Gauge Railway, the Sompolno Narrow Gauge Railway, and the Krosniewice Narrow Gauge Railway. The Krosniewice Railway and the Gniezno Railway – but not the Sompolno Railway – were two of the some two dozen railways that were rescued from the wholesale destruction of the remaining PKP narrow gauge lines in 2001. Thanks to co-operation between the then Mayor of Krosniewice, and the former PKP general manager of the line, the Town Council decided to acquire the Krosniewice line from PKP. At first sight Krosniewice station appears to be open. 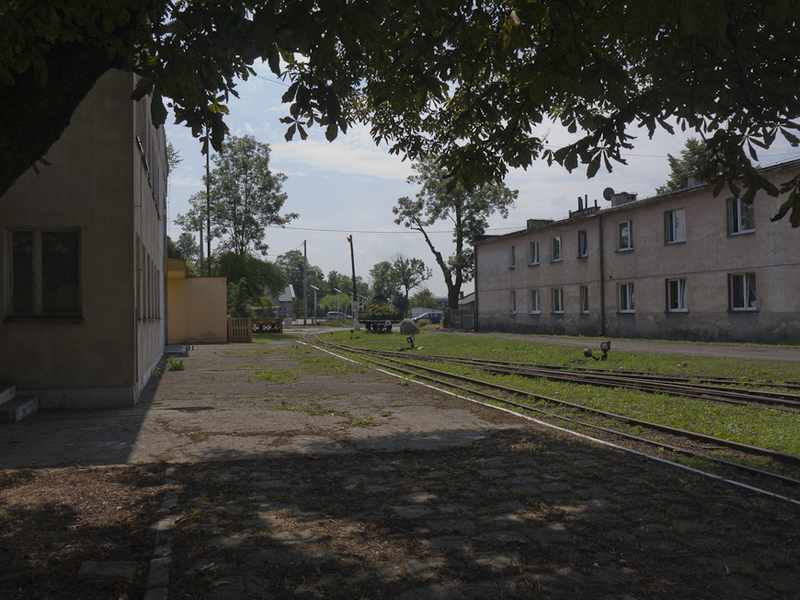 Closer inspection reveals to two changes wrought by Barbara Herman, the Mayor of Krosniewice – the removal of the level crossing barriers across the main road, and the grave-like display of flowers in the platelayer’s trolley next to the level crossing. Photo (CC BY-NC-SA 4.0) BTWT. While the legal formalities for the transfer of the ownership of the line proceeded, the Council obtained an operating licence from PKP SA granted which it sub-licensed to SKPL, a society set up with the objective of carrying on operations on the recently closed narrow gauge railways. The line’s future seemed secure. SKPL operated a regular passenger service on weekdays linking Krosniewice to the PKP stations at Ostrowy and Krzewie. On market days the service was extended to Dabrowice and Wielka Wies Kujawska. But the main work on the line was freight – carrying supplies to and refined sugar from sugar refineries situated on the network. At the peak of SKPL operations the line was carrying 100,000 tonnes of freight a year. Looking to the North – everything appears neat and tidy. Photo (CC BY-NC-SA 4.0) BTWT. The legal wheels turned but slowly – Polish law required PKP to recreate the missing deeds for all the parcels of land over which the line ran before a formal handover could be concluded with Krosniewice Council. Meanwhile, as a gesture of good faith, PKP transferred the ownership of all the line’s rolling stock – including a working Px48 steam locomotive – to the Council. Unlike PKP, SKPL received no central government subsidy. During the off-season it was sometimes difficult to find the money to purchase replacement parts for the diesel locomotives and pay staff. Slowly, disused feeder lines began to vanish… . But a peek across the wall shows that every piece of glass is smashed in the skylight of the workshop roof. Photo BTWT. Meanwhile a group of railway enthusiasts started clearing the overgrown trackbed on the disused track bed between Ozorkow and Krosniewice. While senior SKPL management – based in the Zbiersk Cukrownia HQ of the Kalisz narrow gauge railway – backed their efforts, relations with management and staff at Krosniewice were strained. Perhaps the greatest achievement of local railway enthusiasts was when GDDKiA (Poland’s Directorate of Trunk Roads and Motorways) decided that they needed to take over a section of the narrow gauge railway in the vicinity of Topola Krolewska to build a new wide viaduct across the Lodz-Kutno railway line. Thanks to the energetic lobbying of the enthusiasts, the GDDKiA ended up having to construct a brand new viaduct for the narrow gauge line as well! The narrow gauge freight wagons have received no attention since the line’s closure. Photo (CC BY-NC-SA 4.0) BTWT. In 2006, at special meeting in Ozorkow the supporters of the line decided to formally constitute themselves into the Kujawy Narrow Gauge Railways Society. SKPL Chairman, Tomasz Strapagiel, attended the meeting and gave the venture his support. The Society acquired a passenger coach from the defunct Piotrkow Trybunalski narrow gauge railway and restored it to running order. The Society’s volunteers cleared the trackbed from Krzewie to Ozorkow and, with the co-operation of SKPL, a number of special trains – which proved very popular – were run through to Ozorkow. The Art Deco building in the background is the running shed. Photo (CC BY-NC-SA 4.0) BTWT. Then in 2007 or thereabouts a new Mayor was elected in Krosniewice. Whereas the previous Mayor saw the Krosniewice Railway primarily as a transport undertaking, the new Mayor – Barbara Herman – saw the railway as a lucrative development opportunity. 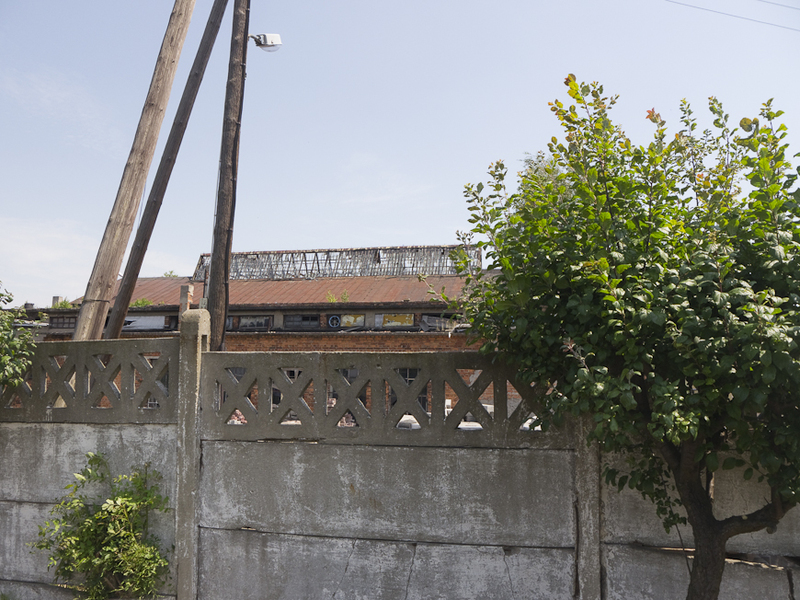 Soon she visited the line, in the company of the local PKP property surveyor, and expressed an interest in demolishing the historic workshop buildings in order to make was for a major new property development – the General Wladyslaw Anders Centre. Recently repainted, the point lever and indicator adds a surreal touch. Photo (CC BY-NC-SA 4.0) BTWT. Mrs Herman requested that SKPL vacate the workshop buildings. 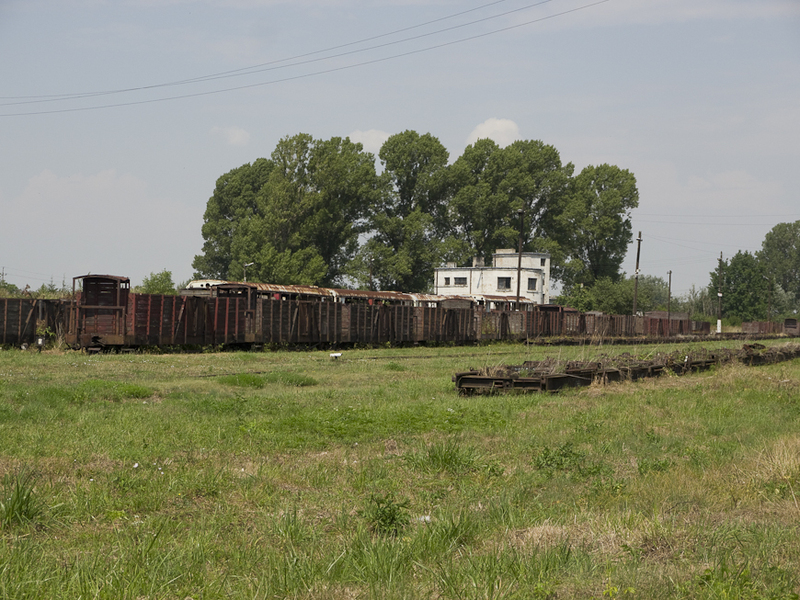 The General Manager pointed out that SKPL needed the workshops to maintain the transporter wagons used to carry the standard gauge freight wagons. The Mayor countered that she had no interest in carrying ant freight though she might be prepared to countenance a small ‘fun fair railway’ somewhere on the site. SKPL refused to vacate the workshop buildings. The Mayor countered by terminating SKPL’s licence to operate the railway. These coal trucks have a special compartment for a brakeman and were last used on sugar beet trains. Photo (CC BY-NC-SA 4.0) BTWT. The last train ran on 31 March, 2008. Ironically SKPL were in negotiation with a bulk aggregate supplier to deliver several hundred tonnes of roadstone required for building the A2 and A1 motorways. Ads a result of the Mayor’s decision roads in the Lodz Province were subject to tens of thousands of tonne km of unnecessary road traffic. The Mayor’s decision provoked a massive storm of protest. Realising which way the wind was blowing, the Mayor trimmed her sails maintaining a public stance that she supported the reopening of the railway. She even allowed local activists to organise a couple of special trains from Krosniewice to Ozorkow to demonstrate her good intentions. Meanwhile, behind the scenes, the Mayor continued her attempts to have the workshop buildings demolished. 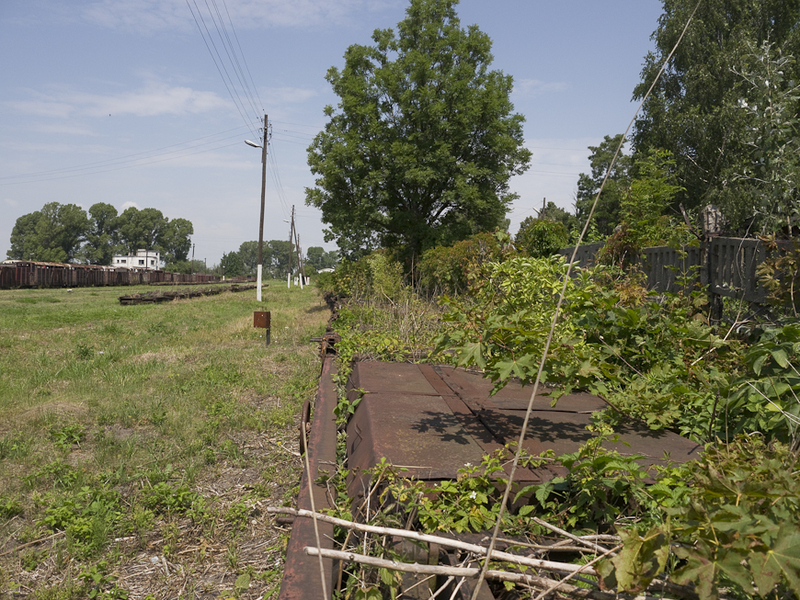 Barely visible under the undergrowth – a line of standard gauge transporter wagons. Photo (CC BY-NC-SA 4.0) BTWT. But the Mayor’s plans hit an unexpected obstacle in the form of the Wojewodzki Konserwator Zabytkow, Mr Wojciech Szygendowski. Mr Szygendowski refused to grant permission to have the historic listed buildings demolished. With her plans apparently thwarted the Mayor decided to reverse her predecessor’s decision to acquire the whole of the Krsoniewice Narrow Gauge Railway from PKP. Instead she came up with the plan that each local council should acquire just that section of line that lay within the its own administrative boundaries. Now the demise of the railway could become a collective affair – one council could use the line for a cycle path, another for road improvements… and as the line died section by section and the historic workshop buildings deteriorated she could try yet again to have them demolished. The low buildings were the machine shops. The smashed windows and doors tell their own story. Photo (CC BY-NC-SA 4.0) BTWT. Without any maintenance, the workshop buildings deteriorate year by year. Unless a ‘white knight’ appears on the scene it seems increasingly like that Mrs Barbara Herman will succeed in her plan to bring about the final end of the Krosniewice Railway. 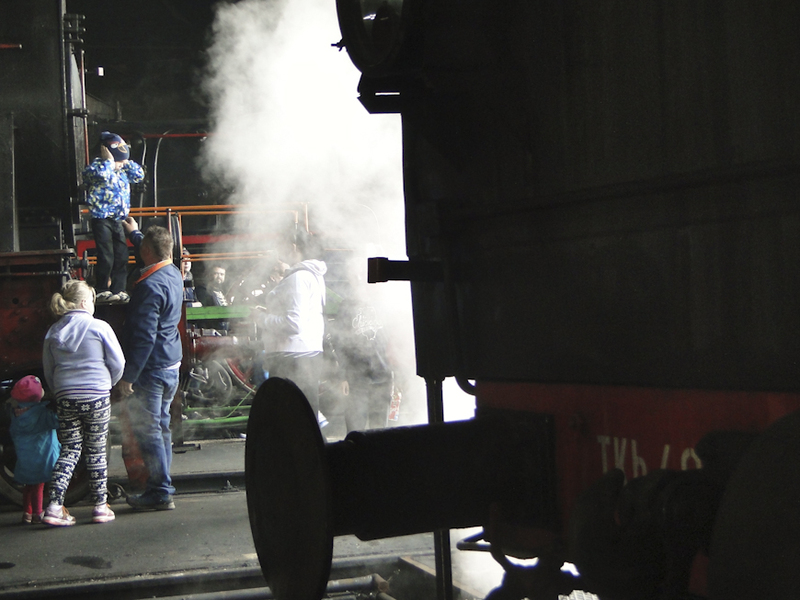 First day of public operation as a 785mm gauge line, 19 June 2014. Video courtesy Sarmacja Film. BTWT has had a longer than usual hiatus. I have had many things on my mind over the last twelve months and at some point all the creative energy drained away. The fact that this Polish railway blog is running at all owes a great deal to our deputy editors, John Savery and Ed Beale. I would also like to thank all those who have provided articles and stories, especially ‘Inzynier’. My thanks to all BTWT readers and contributors. Please do continue sending us your stories and pictures. Our e-mail address is: railfan[at]go2[dot]pl. 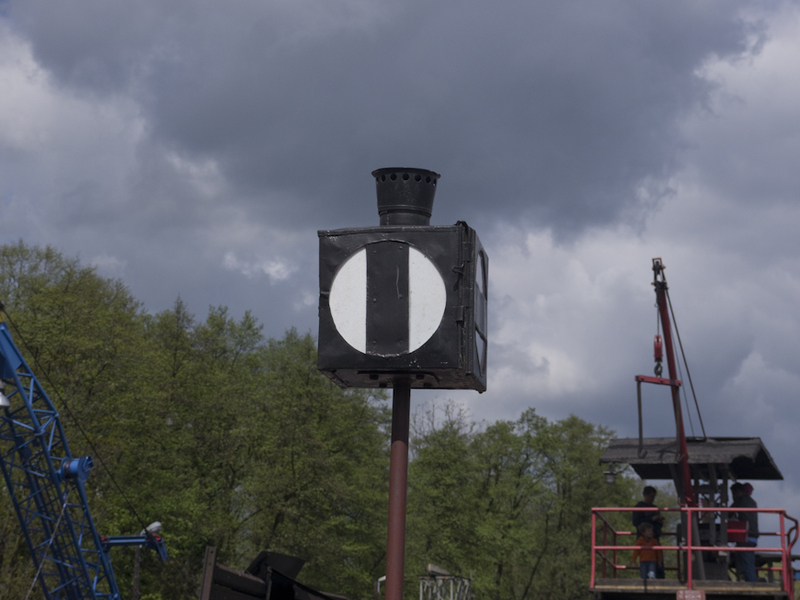 What better to celebrate the return of BTWT than this story about the rebirth of the Park Slaski Railway, a line that many had given up for dead? Our thanks to Andrew Goltz for sending us his photographs. Industrial narrow gauge in the park. Las49-3343 being serviced. Photo Andrew Goltz. The Park Slaski line has had three gauges! It opened in 1957 as a 1,000mm line. Trains were operated by 3 sets of single-directional railcars and trailers. The railcars had to be turned on special turntables located at each end of the line. First the tanks are topped up with water. Photo Andrew Goltz. By 1966 the railcars and trailers were life expired. The line was re-gauged to 900mm – a gauge for which wheelsets and locomotives were readily available from nearby coalmines. Three 2WLs50 diesel locos were acquired and ten light coaches were specially constructed. 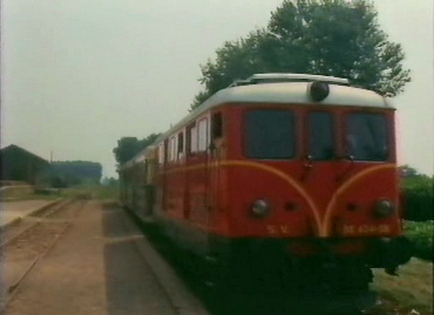 The 2WLs50 locos struggled with the steep gradients between Zoo and Wesole Miasteczko stations and were replaced in 1973 by two more powerful WLs75 locos. Then the locomotive is coaled. Photo Andrew Goltz. In 1988, the WLs75 locos were themselves replaced by two WLs150 locos that had been obtained from the KWK Katowice mine. When they became worn out they were replaced in 1994 by a single WLP50 loco which was painted in garish colours in the style of a steam loco as imagined by a drug user during a psychedelic delirium. Details for model makers. Photo Andrew Goltz. 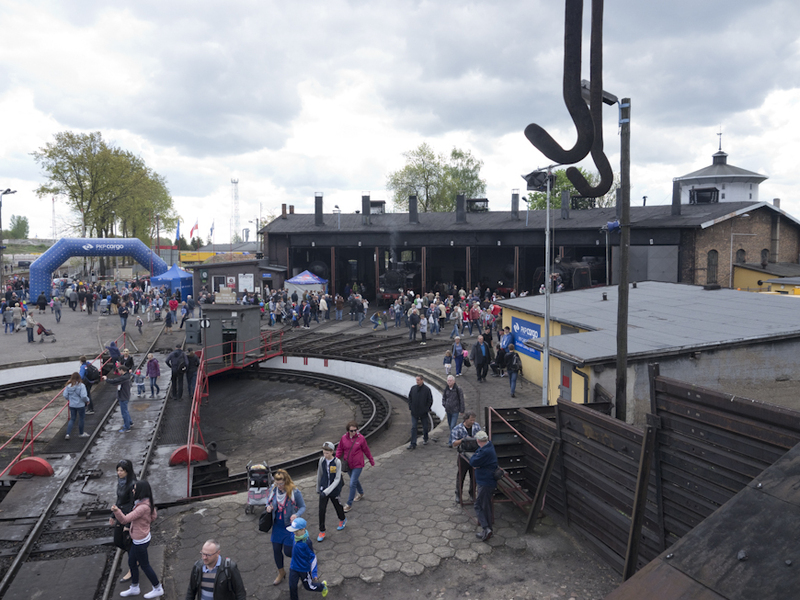 In 2003, the operator of the Bytom Narrow Gauge Railway – the Stowarzyszenie Górnośląskich Kolei Wąskotorowych – took over responsibility for running the Park Slaski Railway.The Society ran the railway until the end of the 2011 running season. By this time services the single WLp50 was breaking down at frequent intervals and services suspended. The track was also in a very bad state. In May 2012 the operating agreement with the SGKW was terminated and in October that same year the track was lifted and the track bed was bulldozed away. 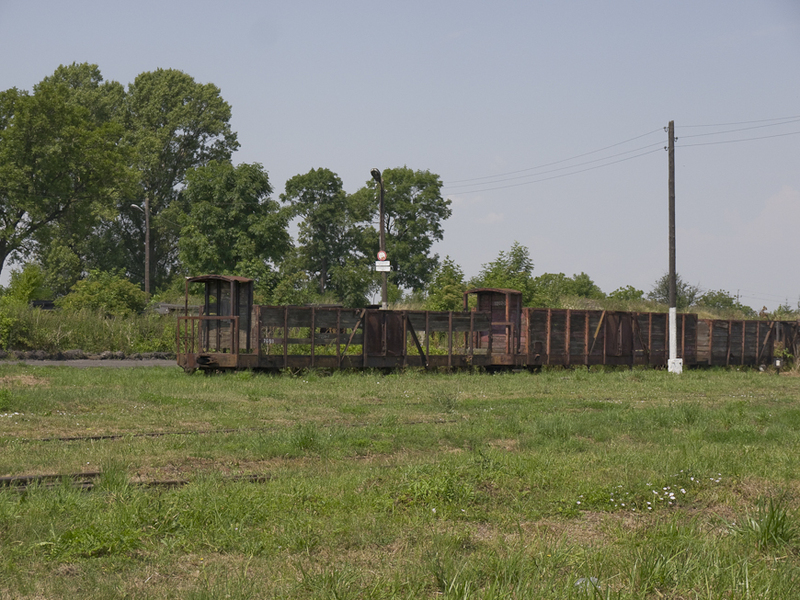 In spite of assurances to the contrary by the Park authorities, many people thought that the track-lifting heralded the end of the Park Slaski Railway. However, in 2013, a new bed of ballast was laid down. 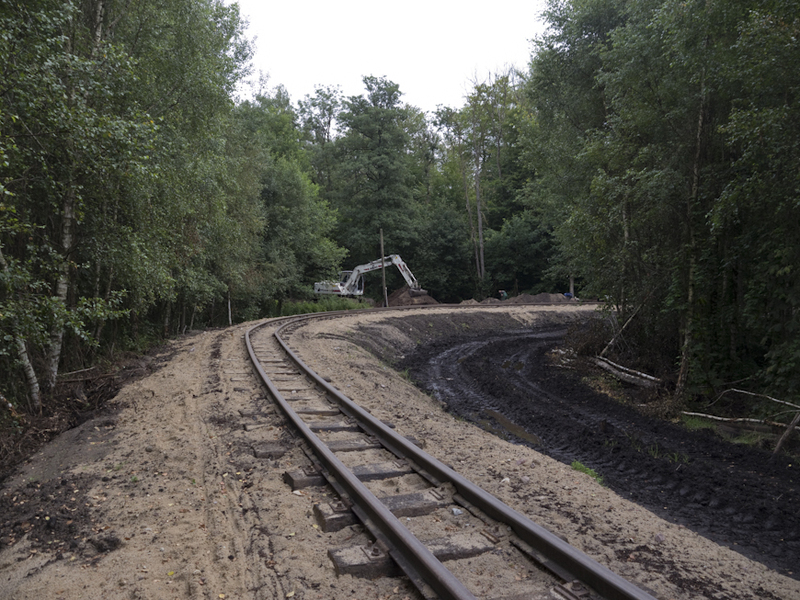 On this the company that had built the 750mm gauge park railway at Krosnice started constructing a brand new 785 gauge railway. Initially the track has been laid between Wesole Miasteczko and Zoo stations (about 1 km) with a spur to the engine shed beyond. Eventually the Park authorities intend that the line should rebuilt for the full length of its former route – just over 4 km. Builders Plate. Photo Andrew Goltz. On the 19 June 2014, operations commenced on the new line utilising rolling stock, staff and volunteers from the 785mm gauge railway at Rudy. Motive power was in the form of a Las49 0-6-0WT and a Romanian Lxd2 diesel. The Las 49 was only supposed to work the first three weekends, but has proved so popular (the police had to be called in to control the crowds of would-be passengers on the first day) that its guest appearance in the park was extended. Rebuilt and relaid 600mm gauge line, but where? In our last Brain-twister competition we asked, What links two of Poland’s newest underground stations with a 15th century confirmation of a union between two nations? Amazingly our previously astute and assiduous competition solvers all seem to have been asleep for this round although it was so very easy! The latest underground station to open in Poland is at Warsaw’s Chopin Airport as reported in BTWT on 22 May. Identifying the station would have won 2 of the 6 marks available. Previous to that the last underground station to open in Poland was not on Line 1 of the Warsaw Metro, but the pre-metro, fast tram station underneath Krakow Glowny main line railway station. Identifying the pre-metro station would have gained another 2 marks. Finally, both stations link to the old Warsaw – Krakow railway which passes through Radom. The Commonwealth of Poland and Lituania was confirmed there in 1401. Identifying Radom and its treaty would have earned the final two points. One carries people on their annual quest to the sun. Is little known, less lauded, but by no means asleep. Engine crew give Pm36-2 a quick check at Wolsztyn. Photo BTWT. Wojciech Lis’s website parowozy.com.pl carries the story that PKP Cargo has recruited 4 new enginemen to retrain to work with steam locomotives at the Wolsztyn shed. Three are former enginemen, the fourth is a young trainee whose higher education is being sponsored by Cargo. We are delighted to be able to report good news in the same post as announcing that BTWT has passed the milestone of 500,000 hits. To all – readers and contributors – who have made BTWT a success our heartfelt thanks. Thanks also to Podroznik for today’s lead story. The ticket hall at Warszawa Centralna 25.2.2012. Photo BTWT. I am not usually afraid of the dark, but as the lights flickered, the power sockets shorted and sparks and smoke flew out of the surge prevention block protecting Sextus, the G5 Power Mac, I confess that I was a little fazed. 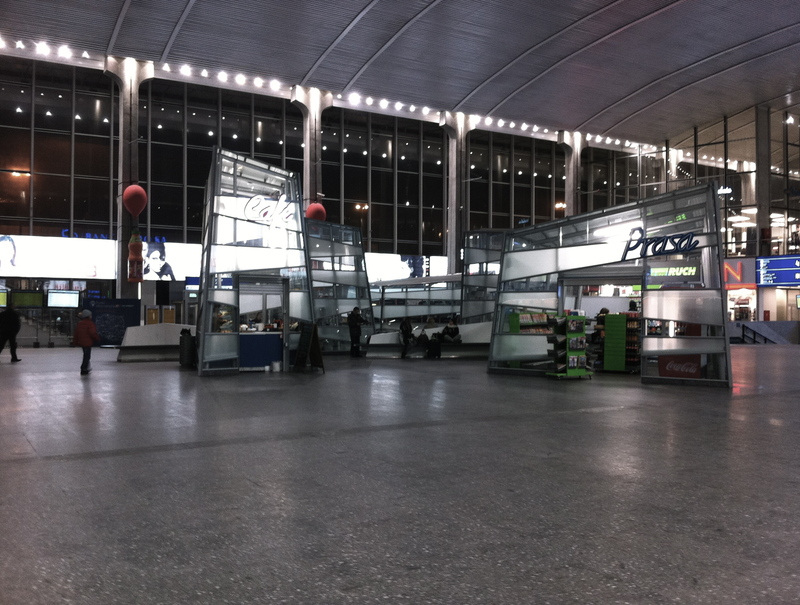 But to begin at the beginning, I was about to travel to Lodz on the 21:49 from Centralna. As this was the last train of the day, I contrived to arrive in plenty of time: not only to catch my train, but also to inspect how the ‘revitalisation’ of the station was proceeding. The main ticket hall was practically empty. Posters advertising the film, Dziewczyna z Tatuażem, added to the eerie atmosphere. How did the original Swedish title, Män som hatar kvinnor (“Men Who Hate Women”) morph to the English version, The Girl with the Dragon Tattoo, only to lose the dragon in the Polish release (“The Girl with the Tattoo”)? A few passengers got on the empty 8-coach train. I settled myself comfortably in an empty compartment and settled down to read Frank Mildmay by Frederick Maryatt on my iPhone. Most of Maryatt’s naval adventures have a good-hearted, but naive youngster, as the narrator. He goes to sea as a midshipman in the British Navy and his character is licked into shape during the trials and tribulations that follow. By the end, our hero is a man, the villains are vanquished and the hero marries his sweetheart. Not Frank Mildmay, the subject is an anti-hero. His decisions start out badly and he never quite manages to free himself from ‘the dark side’. As Maryatt begins to draw all the threads together towards the end of the book, Mildmay rushes headlong into disaster. Too much like real life to be good escapism, I thought. So, as I had already downloaded quite a few other out-of-copyright books, I quickly switch to a Sherlock Holmes mystery. I return home and lean briefly against the wall to ease the weight of my legs. The lights flicker ominously and darken, then after a few seconds they blaze more brightly than they ever did before. Our power sockets crackle, sparks fly from the surge protector and the fuses blow. This being Poland it takes two different electricians, and most of the following day, to restore decent mains power. We seem to have escaped lightly – burnt out power blocks. The main computer, Sextus, is down, but hopefully only the Apple Cinema Display power supply will need replacing. We are lucky, we have escaped lightly compared to our neighbours. They have lost a couple of TVs, a fridge and a router. I buy a massive new Polish surge protector and five PL to UK power socket adapters. I order a new power supply for the monitor from China. I order two new power circuits for the flat. This is being written on Quintus, my trusty 12″ Apple G4 PowerBook. Unfortunately my photographs and most of my programs are on the G5. I yearn for a couple of shots of Zubrowka, but alas, inspired by Michael Dembinski’s example, I have decided to give up alcohol and sugar for Lent. Aren’t I being good? I hear the warning words again, Pride goes before a fall. As the late Frankie Howard used to say, Here endeth the first lesson! It hardly seems possible that Ed Beale’s article about narrow gauge operations in winter was really our 894th post and that BTWT is a month short of its third birthday. Will we still be running in 2015? There is every reason to hope so! We have an enthusiastic readership which keeps us up to date with the latest developments; we have some excellent contributors who send in some first rate articles and photographs; and at last we have a Deputy Editor! I am delighted to welcome Ed Beale to our editorial team. Ed has a light pen and his recent contributions have made BTWT much more interesting and entertaining. 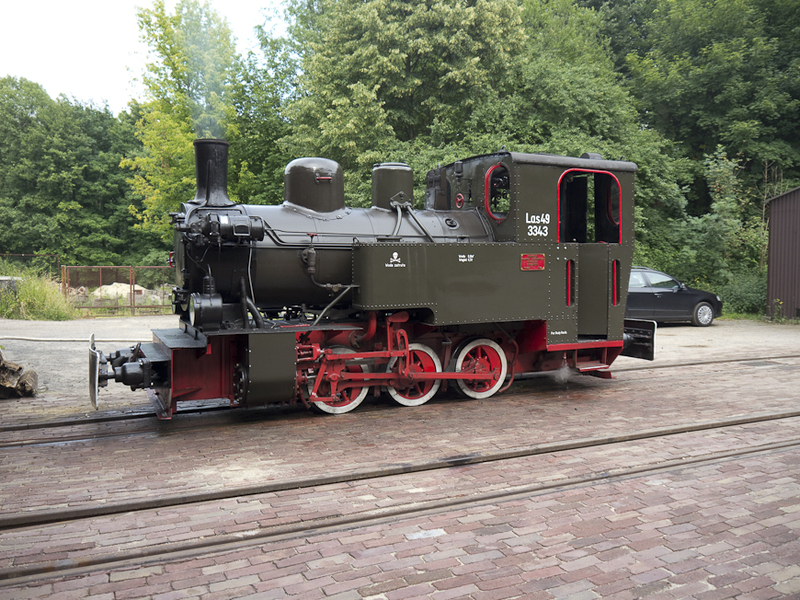 Ed has had a long term interest in Polish railways, especially narrow gauge railways. He has published the Narrow Rail website since 2001 so his commitment to ‘the cause’ is no passing fancy! There will inevitably be period while Ed and the rest of the team adjust to each others way of working and – of course – there is no guarantee that Ed will like the job. So both sides have agreed a two month a ‘running in’ period just to check out how matters work out. So Ed’s formal title is BTWT Deputy Editor Designate, we look forward to dropping the ‘designate’ when the two months are up! There’s a n.g. railway there, somewhere! Satellite photo courtesy Google Maps. BTWT competitions are legendary for dragging on for months and months and our 2011 Christmas Competition is no exception, as it has now extended itself into a Xmas / New Year competition. There will be 4 more instalments after this one, so at the current rate of progress we should be able to announce a winner sometime in March! Our last location (No. 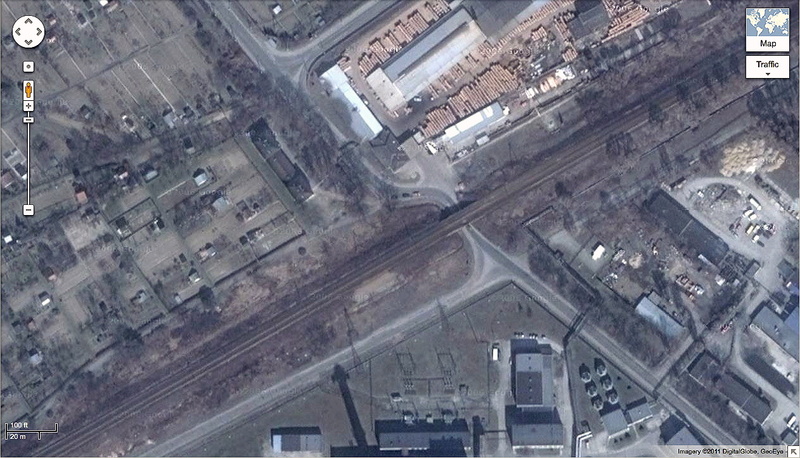 7) was on the Starachowice Narrow Gauge Railway, although the most prominent features on the satellite photo are the formations of the standard gauge lines which were part of the ZGM Zebiec factory. This plant is something of a mystery. It started in the 1950s ostensibly with the mission of extracting and concentrating the iron ore content of the sands which lie in a belt from Lubien through Tychow as far as Mirzec. The process proved uneconomical which should have meant the end of the company. But in Poland anything is possible! ZGM Zabieniec morphed from a mining company to one producing central heating boilers. 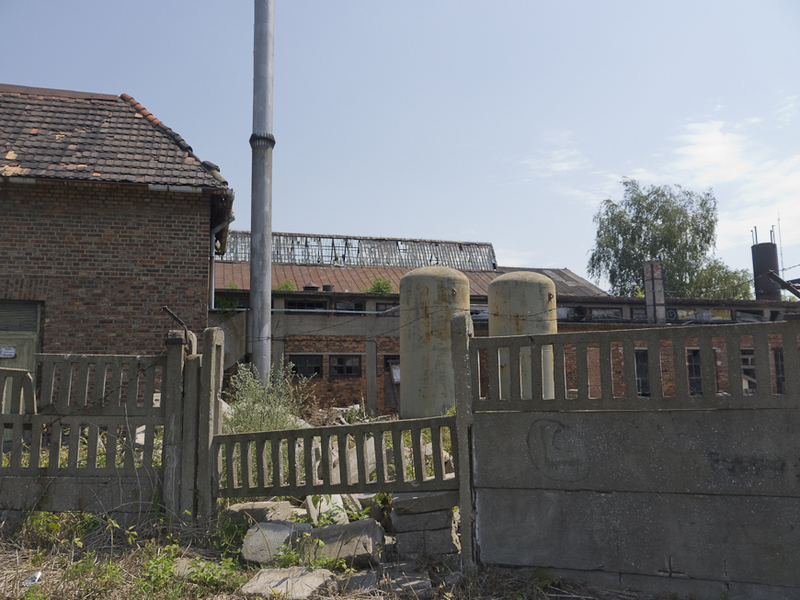 To complicate matters still further we have come across reports that in the 1950s a company in the Starachowice area was engaged in uranium mining and processing. So perhaps the ‘iron ore concentration plant’ was just a cover story? In actual fact the location of the uranium facility – if it existed – is not known to us. 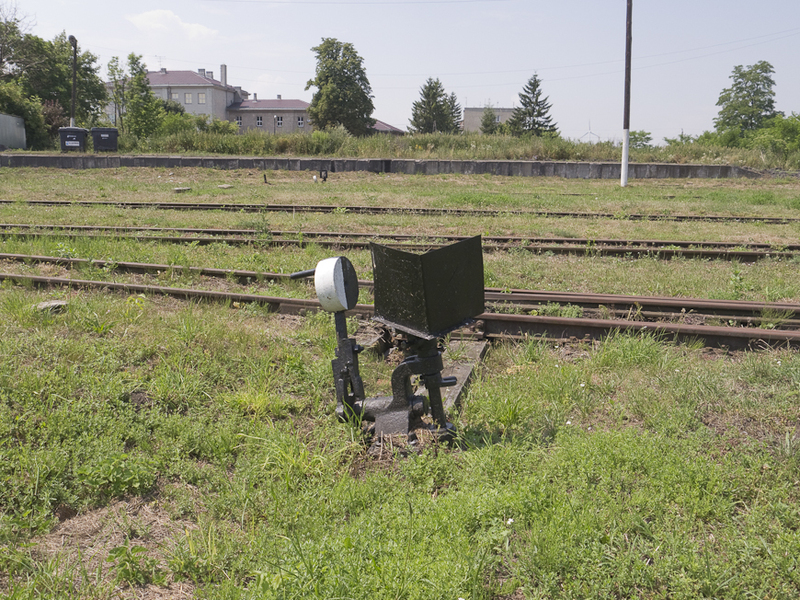 The history of the Starachowice Narow Gauge Railway is no less complicated. Constructed in 1950 to link Starachowice and Ilza, the line utilised substantial portions of a late 19th century 750 mm gauge railway network which carried iron ore to the blast furnaces at Starachowice. 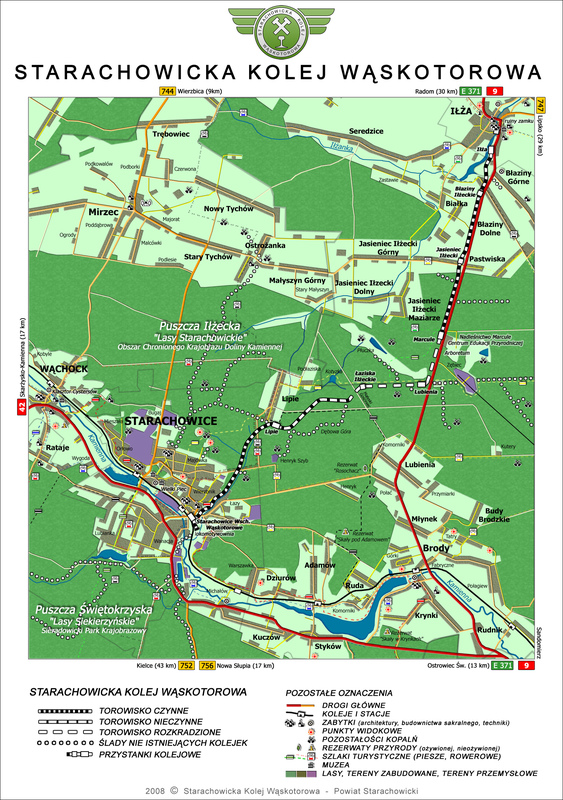 The relationship between old and new lines is shown on the diagrammatic map which was prepared during the time that the line was being operated by the Rogow-based Polish Narrow Gauge Foundation (FPKW). At its peak the pre-PKP n.g. network totalled some 60 km. The 1950 PKP railway was 20 km long. By the 1990s regular passenger traffic had ceased though the line was used for occasional diesel hauled specials. I was lucky enough to see one of these in operation before PKP closed the line in 1997 and transferred the rolling stock elsewhere. Thanks to the lobbying efforts of the FPKW the line was taken over by the Starachowice District Council in 2003 and initially operated by the FPKW. Sadly during the 6 years the line was defunct about a third of the track was stolen by scrap thieves. At the end of the 2008 season, a row between the then FPKW chairman, Pawel Szwed and volunteers led to a decision by the District Council not to renew the operating agreement with the Foundation. During the 2009 and 2010 seasons the line was operated by the Bytom-based Upper Silesian Narrow Gauge Railway Society. In 2011, the line was based by the Friends of the Jedrzejow Railway Association. In practice, much of the volunteer base has remained the same throughout these and only the management has changed. Three correct answers were submitted, by Waldemar Heise, Ed Beale and Inzynier. Waldemar was first and so takes the point. A Google Maps ‘slippy map’ (can be scrolled and zoomed) of the No. 7 location on the Starachowice n.g. railway. starachowice travel – Magistrala główna leśnej kolejki wąskotorowej . 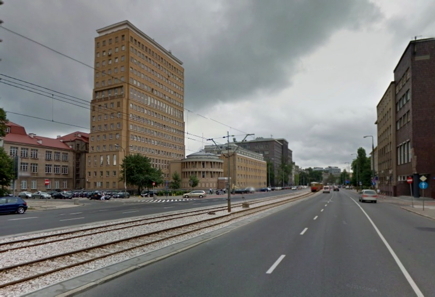 . .
Somewhere in Poland courtesy of Google Maps. But where? Our last competition seemed to go down quite well, so here is another, specially devised for the holiday season. 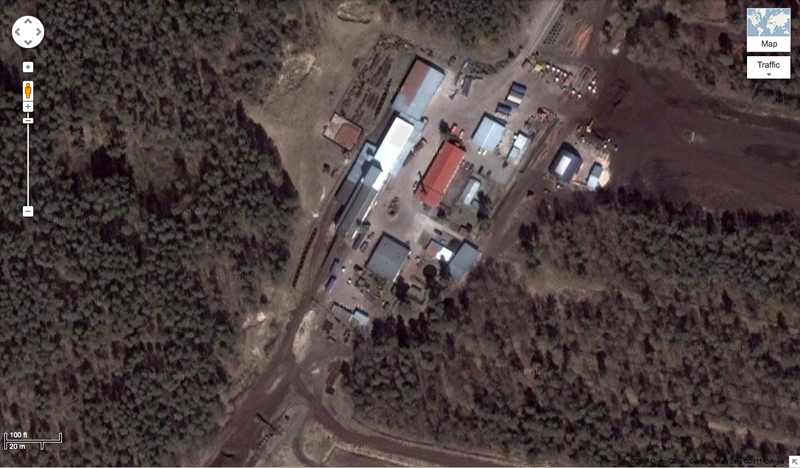 Between now and the New Year we will be publishing Google satellite views of a dozen narrow gauge railway locations scattered around Poland. All you have to do is to be the first to send in the correct answer to gain a point. If no one submits a correct answer before the next question is published, Dyspozytor gets a point. Answers may be submitted either via the Comments facility or by e-mail to our mail box: railfan [at] go2 [dot] pl. The person who gets the maximum amount of points is the winner. The winner gets to take Dyspozytor out for a drink / a bottle of Zubrowka (delete as appropriate!). Early London Underground District line driving coach. Still from Passport to Pimlico. The BTWT editorial team are in Gdansk attending TRAKO, the international railway fair, so today’s post is just a quickie. The last mystery film was the well-loved Ealing comedy film, Passport to Pimlico, made in 1949. Much to our surprise the only person to get the answer right was Gavin Whitelaw. Gavin moves into first place with 4 points, Mike Winslow is second with 3 points, Dyspozytor has 2 points and Alex Fitch 1 point. Amazon UK have a few DVD copies of Passport to Pimlico available for £4:39. A still from what film? GWR Castle Class 4-6-0. 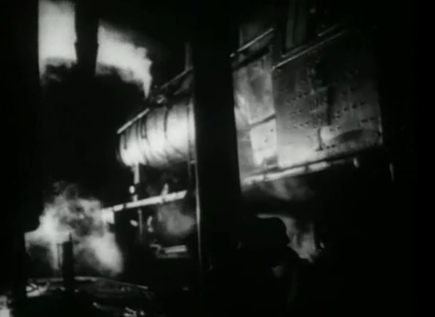 Still from The Ghost Train. Our last competition was a little mean. We think a few more BTWT readers would have guessed that the last still was from the 1941 remake of The Ghost Train, if we had used a clip from the shot above. 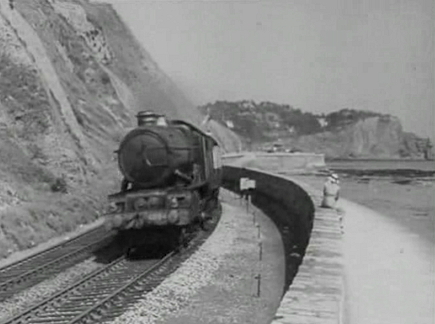 At the start of the film, the train engine – shown running westwards along the seawall at Teignmouth – is either 4084, Aberystwyth Castle, or 4094, Dynevor Castle. 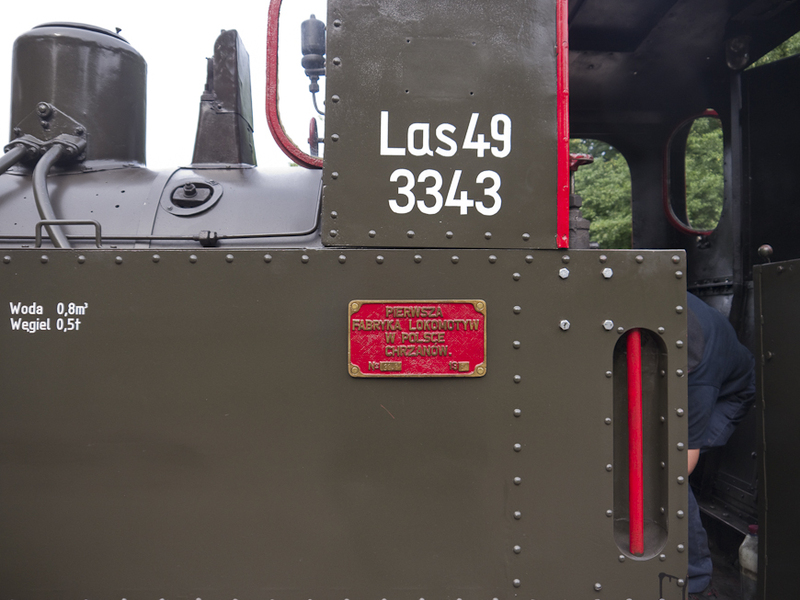 The number on the front buffer beam is not altogether clear. Then for a brief couple of seconds the train engine is shown as a ‘streamlined’ GWR 4-6-0. 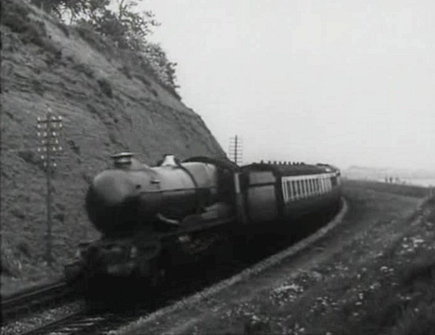 It is said that GWR CME, Charles Collet, had been pressurised by the GWR board to try out streamlining. Only two engines were subjected to the treatment – Castle class 5005, Manorbier Castle, and King class 6014, King Henry VII. By the time the film was made, both engines had lost much, though not all, of their streamlined ironmongery. Which of the two engines, the Castle or the King, was used in the film? It is difficult from the rather dark clip to be absolutely sure. Perhaps one of our GWR experts could identify the engine and give his reasons why? The Ghost Train was originally written as a play by Arnold Ridley and, as such, became a great hit. Ridley was inspired to write it after becoming stranded overnight at Mangotsfield railway station near Bristol. The station was situated on two sides of a a triangle and one of the three routes by-passed the station. The sound of ‘invisible’ trains apparently passing through the station gave Ridley the inspiration to write the play. The play was filmed many times. Our stills are from the film directed by Walter Forde and released by Gaumont in 1941. The film is a treasure chest of GWR memories. It is available as a DVD through Amazon UK for £6-99. The winner of our last round? Gavin Whitelaw, Mark Judd and John Savery submitted corrected answers, but Gavin dashed in first to take the point. The score so far: Mike Winslow and Gavin Whitelaw joint first with 3 points, Alex Fitch and Dyspozytor trailing behind with one point each. A word of warning – so far the going has been relatively easy. Now it’s time bring on our fast bowlers! Today’s mystery film. It’s a googly! Sprague-Thomson first-class car interior in 2007. 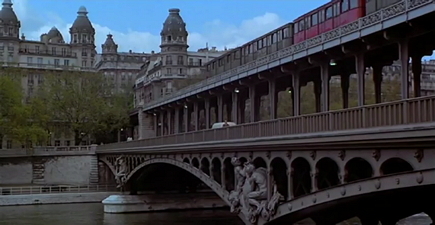 We thought that our last question with the iconic picture of the Sprague metro coaches crossing the Seine in Paris would bring in a great crop of entries. But, much to our surprise mystery film 7 stumped everybody except Mike Winslow who guessed correctly: Barnardo Bertolucci’s 1972 mainstream cinema debut, Last Tango in Paris. The score is now: Mike Winslow in the lead with 3 points, Gavin Whitelaw – 2 points, Alex Fitch and Dyspozytor trailing behind with one point each. Incidentally a number of the Sprague coaches survive on a disused section of the Paris metro. Some great photographs taken by Rookinella can be seen on the Dark Places website. Today’s mystery picture is rather unusual. Who will be the first to guess the film? 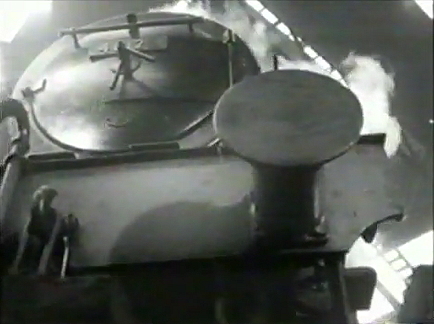 This second clip from Train of Events shows the technical difficulties of recording moving pictures on film in low light conditions. The last mystery picture was from the shed sequence in Train of Events. Congratulations to Gavin Whitelaw and Mike Winslow for identifying the film. Mike Winslow beat Gavin by a couple of hours and so takes the point. The score now is: Gavin Whitelaw and Mike Winslow both in the lead with 2 points, Alex Fitch and Dyspozytor trailing behind with one point each. Train of Events was made by Ealing Studios in 1949 and stars Jack Warner and Gladys Henson. Express locomotives had already been hastily repainted in an early British Railways livery while less prestigious engines still carried LMS markings. The locomotives seen in the train include two LMS Jinty class 0-6-0Ts, and a LMS Royal Scot class 4-6-0 plays a leading role. 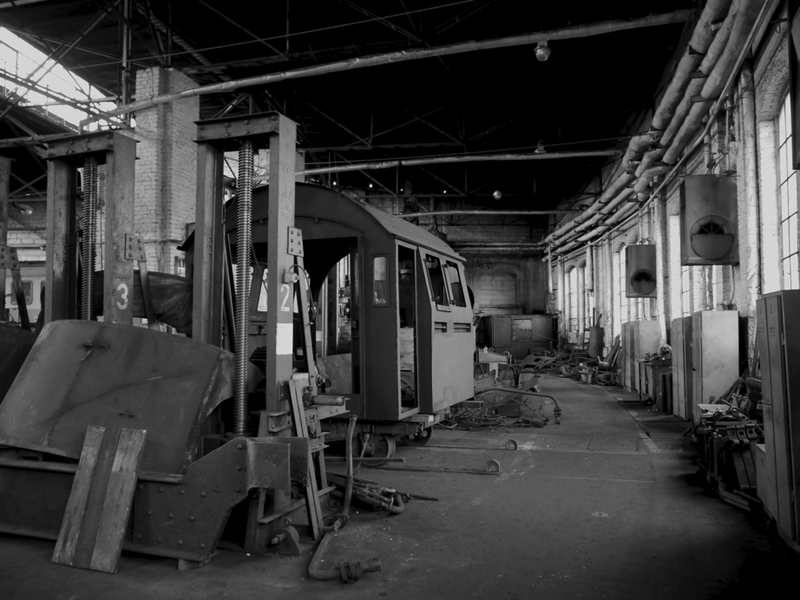 Much of the initial filming was carried out at Willesden Shed – a favourite location in my gricing days. 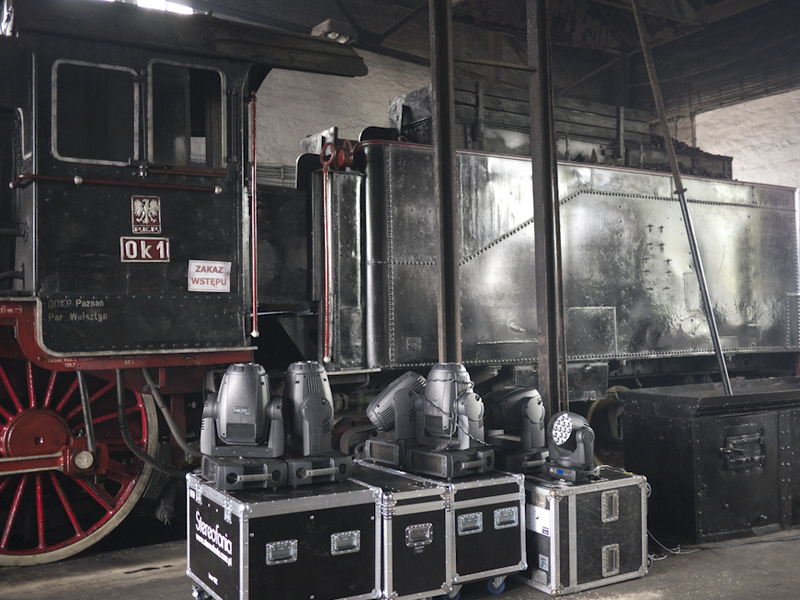 As well as masses of railway technical detail from the days of steam on the ex LNWR main line, the film accurately portrays the hierarchical social relationships in a large steam shed. Train of Events is available on DVD from Amazon UK for only £6:93. 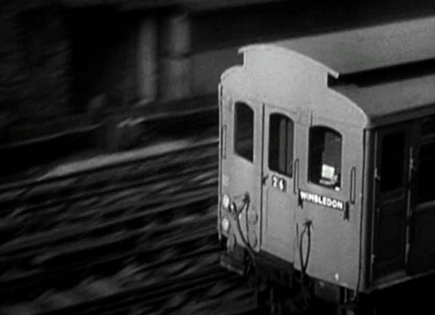 Today’s mystery still is from one of several ‘metro’ stills which feature in our competition. The film is very well known, so again no clues. First one with the correct answer gets the point. A still from our 7th mystery film. Nobody identified the picture of the porter unloading crates as a still from the ‘newsreel’ sequence in Citizen Kane so the point goes to us! The scorecard now reads as follows: Gavin Whitelaw in the lead with 2 points, Alex Fitch, Mike Winslow and Dyspozytor – one point each. 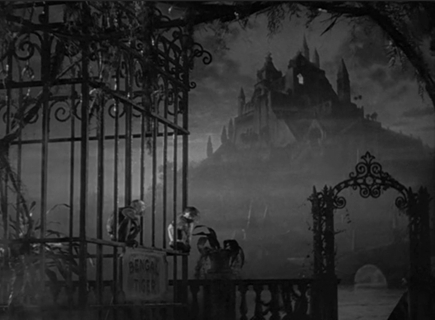 Citizen Kane is one of the greatest films ever made. It was the first film that Orson Welles was to direct, he also played the leading character and contributed to the screenplay. Though made 70 years ago, the film’s original positioning as a modern American story remains true, even today. 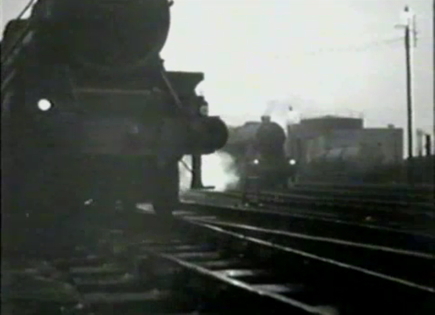 Today’s mystery film should be well known in British railway enthusiast circles, so no clues. First one to post the right answer gets the point. A visit to Poland by Mike Pease, the Vice President and founder of the British-Polish Railway and Industrial Heritage Partnership, provided a welcome opportunity to revisit some favourite railway locations. 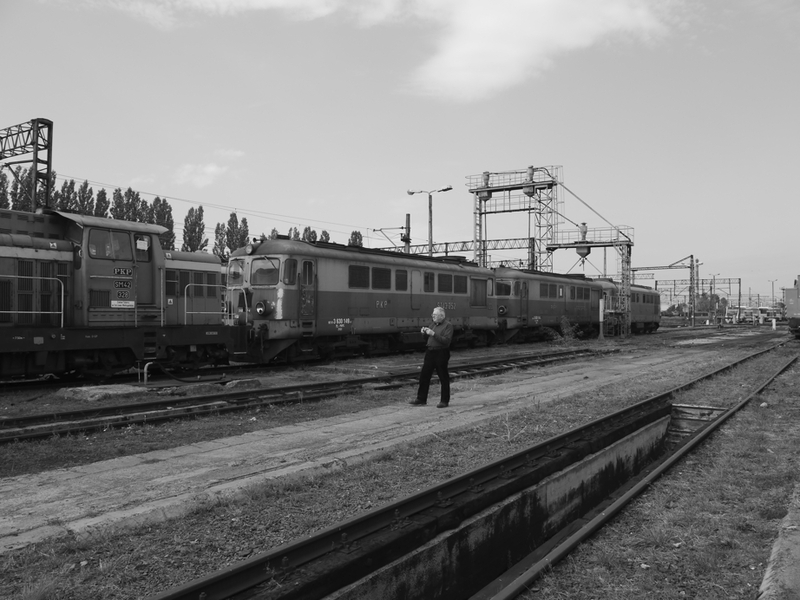 Since the Leszno maintenance depot is well known and well photographed, I thought that this time it would be interesting to take photos in B&W. All the pictures reproduced below were taken on 17 September 2011. This photo shoot brought back many memories: my last B&W shed interior shots were taken some 35 years ago at Tysley and Oxley ex GWR sheds. Thanks to the latest digital camera technology it is now possible to take good shed interior pictures without lugging around a heavy tripod. Wearing the regulation Polish railway ‘uniform’ of blue shirts and dark trousers, our visit brought in a bumper crop of pictures and passed off without any incident. Vintage railway enthusiast and a line of vintage diesels. Ol49 cab undergoing a makeover. What is the engine lurking in the back? A closer look reveals a complete Ty2 ‘plugged in’ to the depot’s central heating.